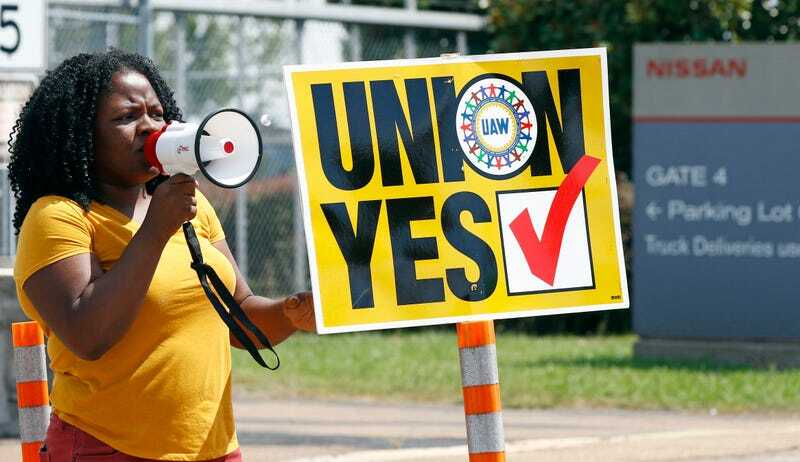 A hotly contested motion to unionize a Nissan production plant in Canton, Mississippi has failed, according to the United Auto Workers, by nearly a 2-to-1 majority. In the weeks leading up to the vote held Thursday and Friday, tensions were fierce and testimonies showed a divided workforce that ultimately voted 2,244 to 1,307 opposing unionization. The loss strikes a huge blow to the UAW, which has focused on Nissan’s plant and workforce in Mississippi for years in an attempt to mobilize a movement towards unionization for workers across the southern U.S.—a prospect that has always been a quagmire of political tension, household debate and strong concern over issues of race. ﻿The courageous workers of Nissan, who fought tirelessly for union representation alongside community and civil-rights leaders, should be proud of their efforts to be represented by the UAW. The result of the election was a setback for these workers, the UAW and working Americans everywhere, but in no way should it be considered a defeat. Perhaps recognizing they couldn’t keep their workers from joining our union based on the facts, Nissan and its anti-worker allies ran a vicious campaign against its own workforce that was comprised of intense scare tactics, misinformation and intimidation. American workers need champions more than ever. The workers of Nissan deserve to have the job security, safe working conditions and collective bargaining power that come only from belonging to a union. The UAW will continue to be on the frontlines of that fight for all workers. Nissan’s response to the vote claimed “the voice of Nissan employees has been heard,” with expectations “that the UAW will respect and abide by their decision and cease their efforts to divide our Nissan family,” which is actually the opposite of what unions do. In the weeks leading up to the decision, the arguments for and against the unionization effort included concerns over not just pay and benefits, but respect, understanding and equal status from Nissan for its workforce. Some workers argued that Nissan’s plant brought higher-paying and higher-skilled work to people who otherwise wouldn’t be able to secure such a living in the area without it. Others argued that Nissan took advantage of the work standards, knowing that, to many workers, plant work would be the best opportunity they ever had, whether or not they were able to better manage their relationship and benefits with their employer. And another issue looms awkwardly over the forthcoming vote: race. A large majority of the nearly 6,500 workers at the Nissan plant are African-American. One does not have to search hard for racial overtones. Along with some of her co-workers, Ms. Matthews, who is black, claimed that white supervisors rewarded white workers who were their friends with cushier assignments. “You’ve got Billy Bob as your manager, you go duck hunting, possum hunting together,” she said. The U.A.W., for its part, has taken pains to highlight the campaign’s racial dimension. In its news release announcing the impending vote, it quoted a worker who accused Nissan of violating African-Americans’ labor rights even while marketing cars to them. The UAW was accused of buying support from local religious and civil rights groups, but claims to have backed the groups long before the unionization vote. Other local leaders messaged that the plant workers “ought to be glad to have a job,” according to the New York Times report. Following the result of the vote, it would seem that message won the day, with worker concerns that a strike would lead Nissan to fire everybody, or that a union victory would somehow force Nissan to close down the plant and abandon the state, although the current national political climate would likely discourage that sort of action on Nissan’s part. Either way, this is a huge blow to the UAW and the labor movement in the south, and leaves the Canton, Mississippi Nissan plant with about a third of its workforce alone with their concerns over workplace equality and company representation. Those who argued that the Nissan plant is the best thing that’s ever happened to the community just guaranteed that, at least in the immediate years to follow, it’s all they will get.